Quality Standards for End-of-Life Care in Hospitals: Making end-of-life care central to hospital care. 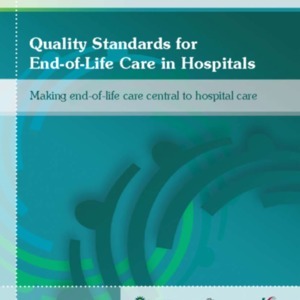 Report on how to identify and implement quality standards for end-of-life care in a hospital setting. Helen Donovan. Michael Browne. Daphne Doran., “Quality Standards for End-of-Life Care in Hospitals: Making end-of-life care central to hospital care. ,” Archives Hospice Foundation, accessed April 21, 2019, http://archives.hospicefoundation.ie/document/118.